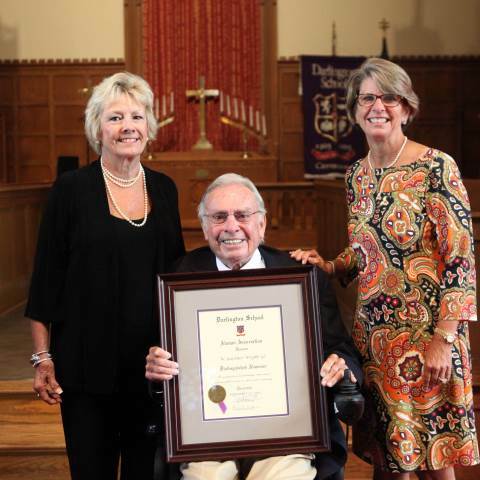 Life Trustee Gardner Wright ('47) pictured with his daughters, Suzanne (Wright) Protz (’71T) and Mary Helen (Wright) Heaner ('77) at the 2013 Darlington Celebration where he was named Distinguished Alumnus. It is with sadness that I share with you news of the passing of Gardner Wright, Class of 1947, 2013 Distinguished Alumnus and Life Trustee. Gardner was the Darlington Tiger we all strive to be. A day student from Rome, he enrolled at Darlington in the sixth grade. While here, he played football, baseball, was business manager of the Jabberwokk and received the J.R. McCain Award. Gardner was particularly proud to have been a member of the Honor Council six of his seven years at the school. Gardner’s remarkable personal and professional life embodied the Darlington ideal of Service Beyond Self. His service to his chosen professional organizations and to the Rome, Georgia, community is no less than the stuff of legend. His lifetime of service to Darlington is no different. In the 113-year history of the school, Darlington has recognized only 65 people with the designation of Life Trustee. Gardner took this designation as seriously and thoughtfully as he did everything else, attending Board meetings and senior dinners through this year. He was also a member of the J.J. Darlington Society and the J. Daniel Hanks Sr. ('27) Heritage Society. Thank you, Gardner for a life well-lived and for your service and commitment to the greater good. Click here to read more about Gardner and his accomplishments.